We aim to keep our pricing, payment and other financial procedures transparent and comprehensible. On admission and on discharge, there are certain standard procedures which we kindly request you follow. If you have any questions about charges, your bill or payment, please contact our International Patient Coordinator. For patients having agreed on a standard package price, we require a payment of 15% of the standard package price on the day of first consultation(s) and investigations, this amount will then be deducted from payment of full standard package price. 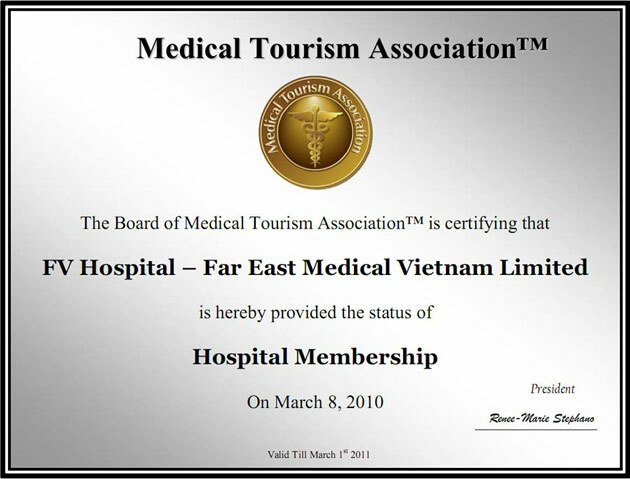 We require you to pay the standard package price agreed between us on admission before hospitalisation. For patient having a medical insurance coverage we require an acceptable guarantee of payment from your insurer prior to admission. Where possible, we will seek, during your hospitalisation, your approval before you incur any charges for medical services in addition to those included in the package price agreed between us and any charges for non-medical services and other incidental charges. These additional charges will be added to your bill and you will be required to pay the same prior to discharge (for insured patientsthis sill not apply if we have received an acceptable guarantee of payment of the same from your insurer). All our prices and charges are in United States Dollars. We may accept payment in other currencies based on the US Dollar exchange rate set by FV Hospital on the date of payment. You can pay by Credit Card (Visa, Mastercard, American Express, Dinners and JCB) or in cash (US dollars, Euros, or even Vietnam dong). You will not be charged if you decide you wish to cancel your procedure prior to your first visit to FV Hospital. In the unlikely event that you wish to cancel your procedure after your first consultation(s) at the FV Hospital, we will only charge you for the consultation(s) and any tests we have already conducted. In the case of post-admission cancellation for any reason, we will charge for the services provided up to the date of cancellation.